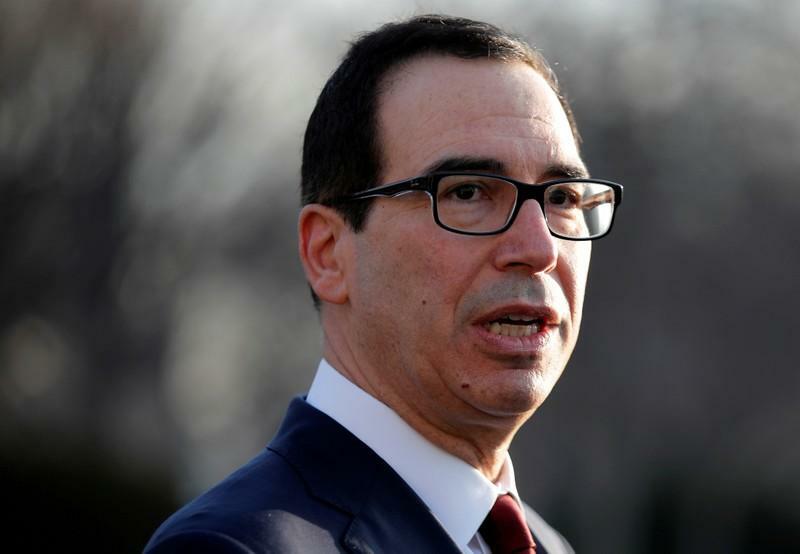 WASHINGTON (Reuters) - U.S. Treasury Secretary Steven Mnuchin said on Tuesday that Treasury Department lawyers had held discussions with the White House about an expected request from House Democrats for President Donald Trump's tax returns. Mnuchin, at a House Appropriations subcommittee budget hearing, said the "informational" conversations had taken place before House Ways and Means Committee Chairman Richard Neal's request last week for six years of Trump's tax returns. Democrats are pursuing Trump's returns under a legal authority that aims to prevent interference from the White House on the Treasury's decision whether to release the tax returns. "I believe that was purely informational," he said of those discussions. "We had obviously read in the press that we were expecting this. I personally wasn’t involved in those conversations." Mnuchin said that the Treasury would "follow the law" regarding Neal's request for Trump's tax returns, adding that this was being reviewed by the Treasury's legal department. On Sunday, White House Chief of Staff Mick Mulvaney said Trump's tax returns will never be handed over to Democratic lawmakers, in defiance of an effort in Congress to learn more about the former real estate mogul's personal finances. Asked on "Fox News Sunday" if congressional Democrats will succeed in obtaining the Republican president's tax returns, Mulvaney said: "No, never. Nor should they.". "I think this committee would like to know if in those communications, the White House had expressed their desire to you or anybody else at Treasury what their views (are) or how you should act on this matter," Quigley said. "So if you would pass that on it would be greatly appreciated."